Everyone loves Portuguese egg tarts and I am sharing my Portuguese egg tarts recipe with you. I did not make these Portuguese egg tarts from scratch. As a non-baker, I always take short cuts when it comes to baking. For the shell, I “cheated” with a pack of off-the-shelf Betty Crocker Pie Crust Mix. You can also use Pillsbury frozen and rolled pie crust. The instant pie crust mix did not disappoint. The crust was so flaky and the texture was so light. If you don’t like your Portuguese egg tarts too sweet, you can reduce the sugar a little bit. This famed bakery is a legend in the San Francisco Bay Area. The line is longer than the Great Wall of China, but let me assure you that their egg tarts are well worth the painful wait. Don’t expect any good service from the shop keepers either, but do expect a lot of satisfaction from the hot-off-the-oven egg tarts. Golden Gate’s egg tarts are 5 fingers licking good. This is the best kept secret of Southern California. Jim’s egg tarts are equally sublime and the crusts are so flaky they are to die for. Trays and trays of egg tarts are served right out of the oven but they are usually gone in no time. Call ahead to get the freshest and prettiest selection. Opens from 7:30 a.m. to 7:00 p.m.
Preheat oven to 400 F. Butter the muffin pan. Bake the Portuguese Egg Tarts at 400F for about 15-20 minutes or until the filling turn brown. If you use Pillsbury frozen pie crust, you just use it as is, meaning just cut it out into 10 rounds and fit into your muffin pan. Looks like I can give this Tart recipe a shot. But wait! I need to buy an electronic mixer first. a new —– is born ! After this post, I completely defer to your wisdom, oh great Rasa Malaysia. Any restaurant you recommend, I’m there. Yes, you are absolutely right, Golden Gate Bakery has the BEST egg tarts on this side of CA! Teckiee – I see that you can’t wait for my FEDEX and already got yourself King’s egg tarts. WMW – now I am very intrigue by King’s egg tarts; will have to try them out the next time I go to KL. BSG – Thanks for your admiration and confidence in me, I day dream that one day I will be a ****. LOL! PE – you are too kind. Gotta head up to load up those delish egg tarts at Golden Gate. Simply heavenly…yummy. Great idea about the pastry! Why didn’t I think of it before. Thanks for the recipe. I like Portuguese egg tarts better than the usual ones. This one gives the oomph! How come you preheat oven to 200F? Shouldn’t it be 400F? Can use the same Betty Crocker Pie Crust Mix or not? Regarding the curry puff shells, I will post the recipe soon. Hi there, I recently came across your blog while searching online for Malaysian recipes. I had to try this one, since I dearly miss egg tarts (and also because I already had most of the ingredients, aha). They turned out really well! Didn’t look quite as good as yours (I got confused about the 200 then 400 oven temparature, so I turned it up to 400… Now I know! ), but delicious. I look forward to trying your other recipes! Thanks. :) Oh yeah, do you take recipe requests? If anybody reading this page is ever coming to macau, China you can try our original egg tarts (actually called “cream” cakes in the direct translation from the portuguese or better yet “nata”). We are portuguese, so we know how to make them. Our website is at nataworld.com take a look and gives us atry next time you’re in Macau. These look great! Can I ask, what size muffin tin did you use? Thanks for the receipe btw ! 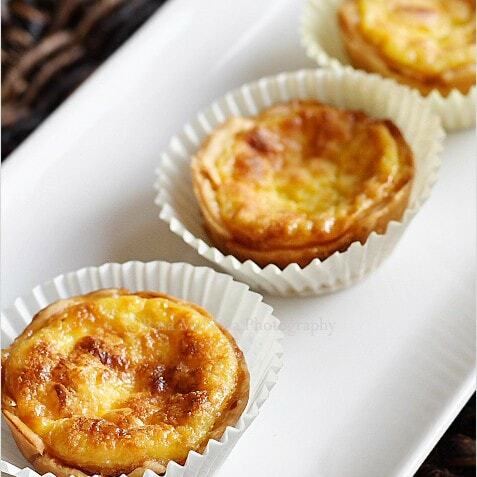 The usual Macau egg tarts are based on a centuries-old Portuguese Recipe. The Portuguese version is healthier then the egg tart and it’s called a NATA. There’s a place in Macau selling these and they are really great in my opinion. Everytime i’m in Macau I pop by the cafe and have a bunch with my family. For me, the portuguese NATA tastes much better. This is the only place you can get them in Asia as far as I know. Had some tarts from Cuppa, not as good, to my taste, as Stowes. Take the bus next time and give them a try. 2) bake the pastry part a bit before putting in the egg part. I haven’t tried the second suggestion myself (next time), but I had a lot of trouble with the cooking time and had to keep slicing up a sacrificial tart to see if it was cooked. Also, mine were browned at the end, but I would have liked them yellow still. However, they still tasted good with a buttery, flaky crust and sweet filling. OK – don’t believe Stowe’s used Betty Crocker in their egg tarts. Had the opportunity to recently go to Macau and to Stowe’s, great tarts, also had them at various places in Taipa and Macau, but not quite the same quality. Will try your Betty Crocker method and judge from that. Great that the recipe works for you. OMG these look divine! I have to get my hands on some of these. I’m in LA next week. Maybe I’ll have time to go to Jims. I hope! Good luck. I haven’t been to Jim’s for a while, I need my fix of egg tarts. I finally tried this recipe today and it was good, except the Pillsbury pie crust was really salty and it kind of ruined the flavor of the inside. We Portuguese use puff pastry to make the Pasteis de Natas or also called Pasteis de Belem. The Portugese Tart that I had in Portugal are made of puff pastry. They are crunchy from the outside. I like them, but the filling was a bit too sweet for me. I still prefer the Portugese Egg Tart filling in our version (the Malaysian version). the recipe show 1/3 milk…can u specific what is the milk? fresh milk? evaporated milk? Does portugese tarts in Macau haf lard or do they use vegetable oil as part of their ingredients? I’ll be goin to Macau and would like very much try some egg tarts! I’m from Singapore but I now live in Cambridge, UK and I’ve been missing home food for a seriously long time. After some godforsaken craving I had, I googled Portugese Egg Tart Recipe and this site was the first that came up. I tried your recipe, precise to the very last bit. And guess what? THEY WERE AWESOME! Hello! I tried the recipe but the egg custard came out too frothy? I beat the egg mixture in an electric blender, then there was just a foam mixture! Did I do it incorrectly? Thank you! You had too much air in the egg custard. Beat it with hand so there is no air. Try it. Thank you for sharing this recipe, I just made them and they were delicious! I am not sure what happened but many people have tried this Portuguese egg tarts recipe with great success, and no, the filling is definitely not like scrambled eggs. It’s smooth and silky. I would like to know why these are tagged as Chinese and Asian, when Portugal is not only NOT Chinese, but is also European…? This is the Chinese version of “Portuguese” egg tarts, you probably won’t find it in Portugal. It’s a Cantonese egg tarts but with a creamy custard. This is a great site, I have often come here for recipes search. However for this recipe,I would like to ask, what is the type of milk we are using here? Also, I have often seen recipes indicating “milk” as an ingredient but very often which type of milk is not specifically indicated. Do you have any idea? Regular full milk you get at stores. Hi! Can i use pastry puff dough instead of pie crust? Thanks! I really enjoy reading your blog full great food. Can you share puff pastry please. I’m going to make these Portugese Tarts this week. Can I use won ton skin for the shells? My local restaurant uses them and they are delicious.Thank you. How would I prepare them? Your Portuguese Egg Tarts have no burned marks on top. How come? Why did you use shortcrust pastry instead of puff pastry? Furthermore, your tarts sunken and are not shiny. This shouldn’t be the case right? And as far as I know, PET normally use puff pastry to make the tart shell. I found this out from those tarts sellers in Macau. You can use puff pastry if you like. My Portuguese egg tarts have burnt marks, but not the super dark types. You can bake longer to make it look darker. Th sunken custard is because of too much air in the egg mixture. Thank you so much. Take care.